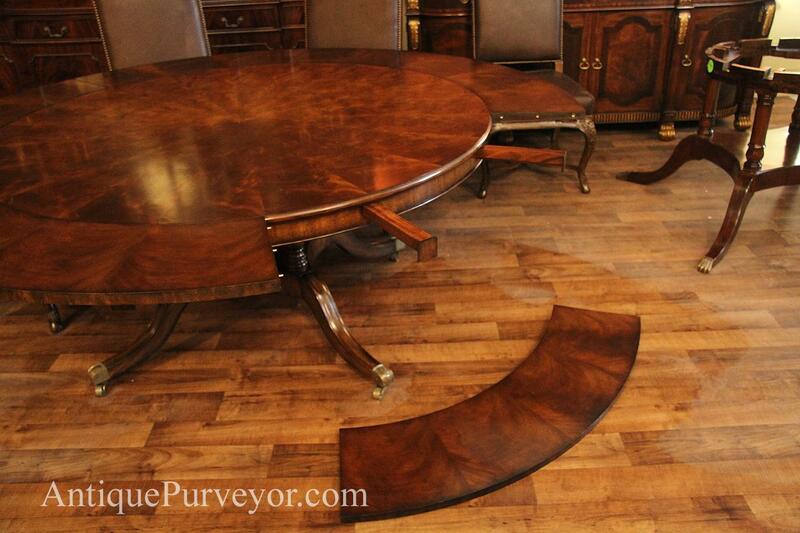 Pie-cut loose swirl mahogany dining table for more casual spaces. 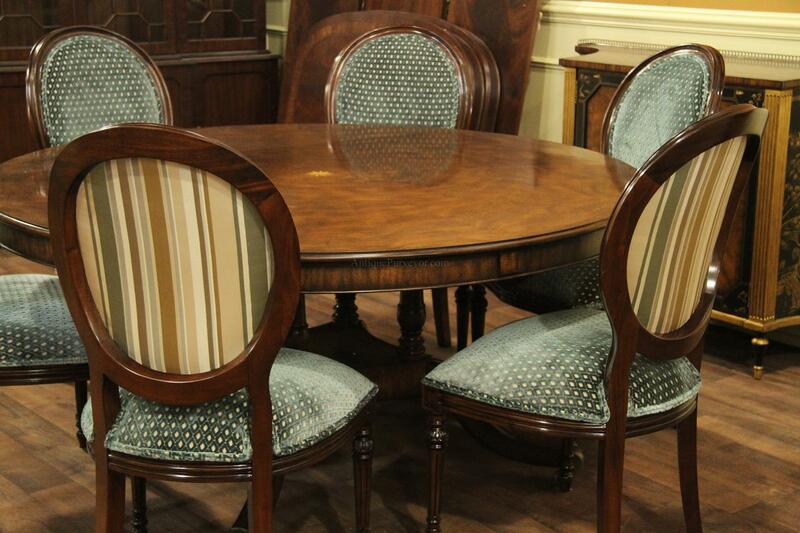 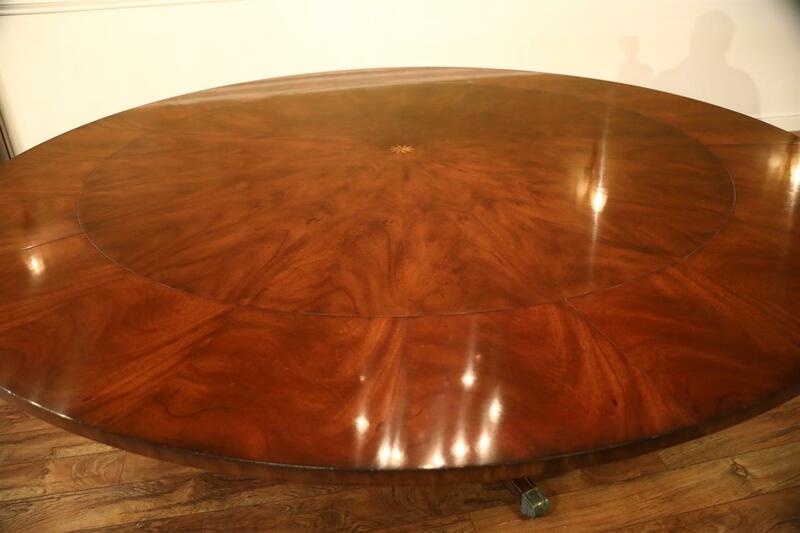 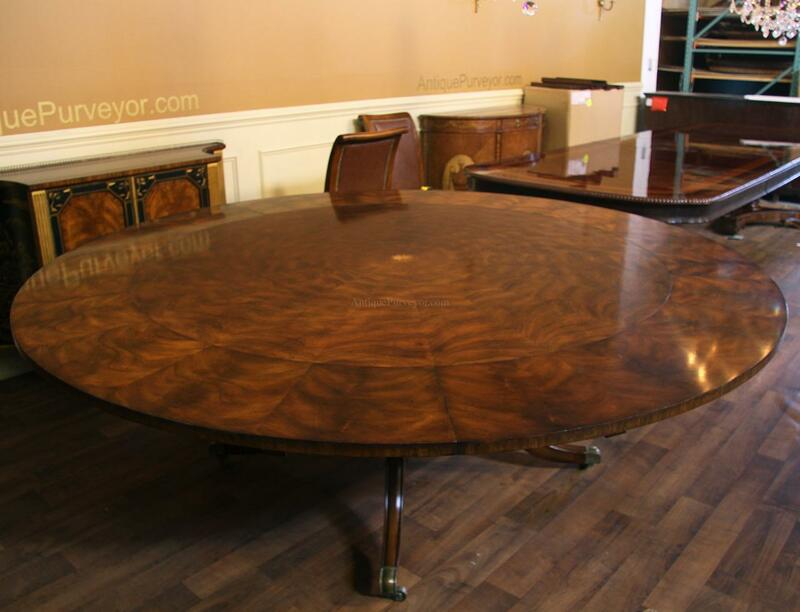 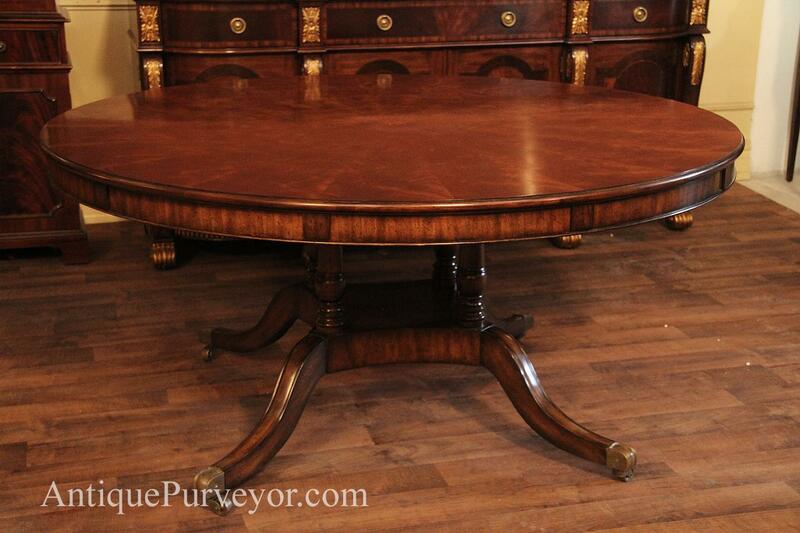 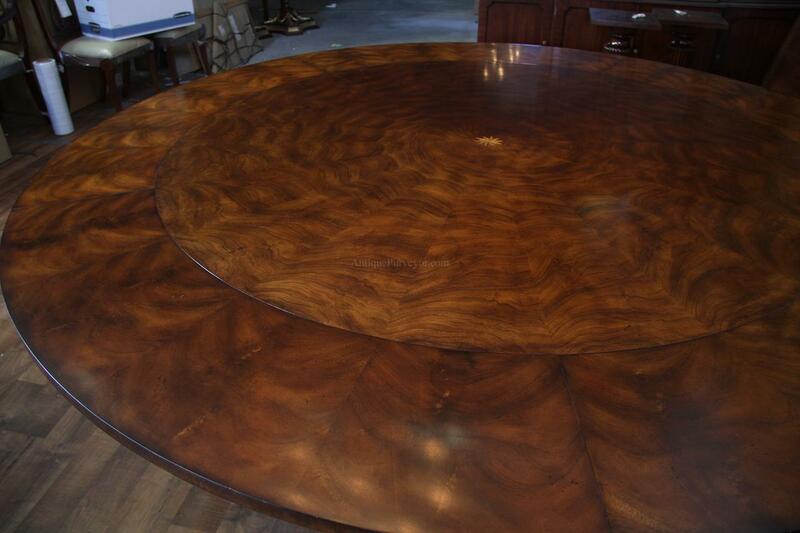 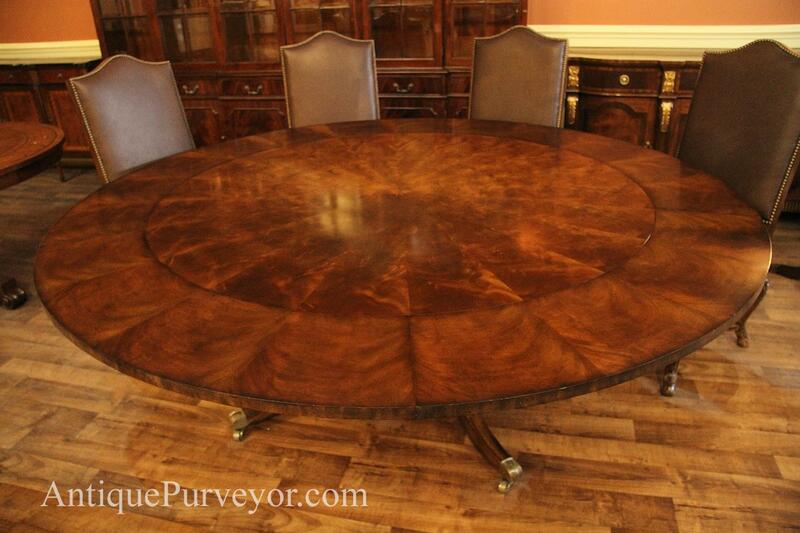 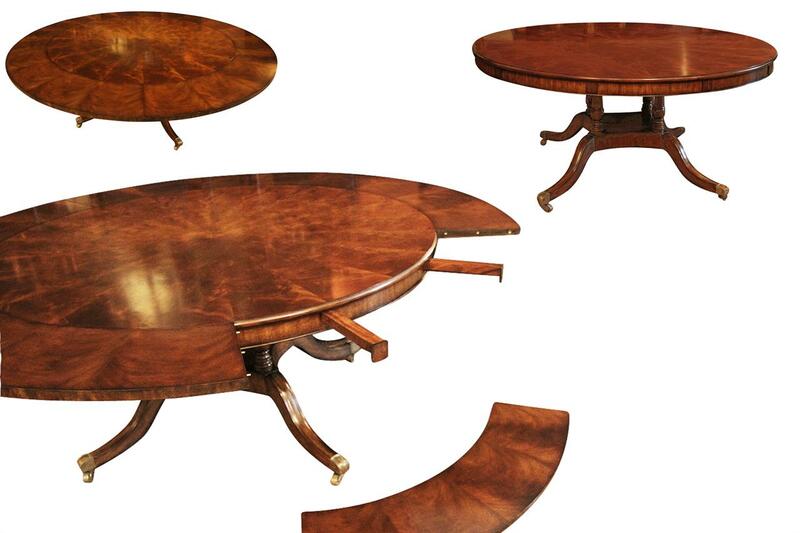 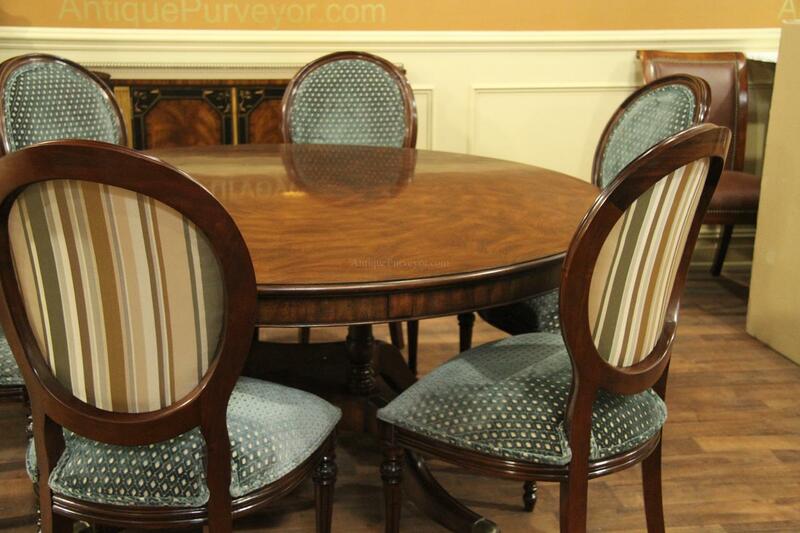 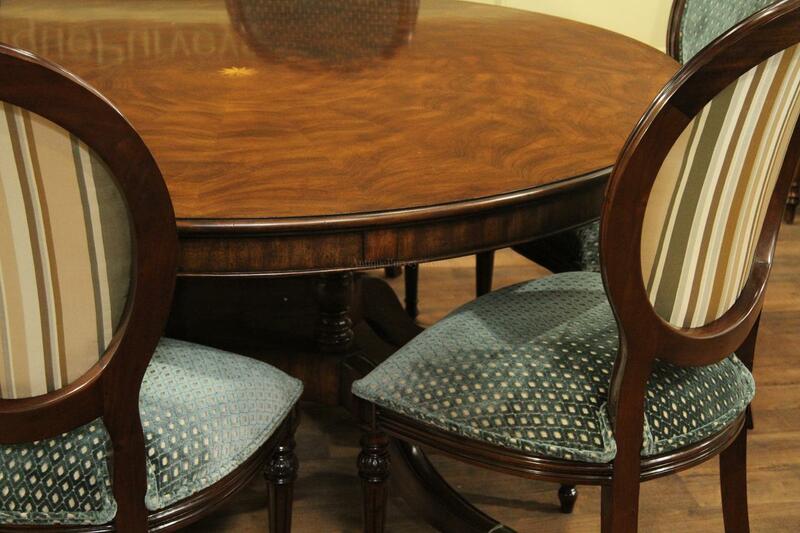 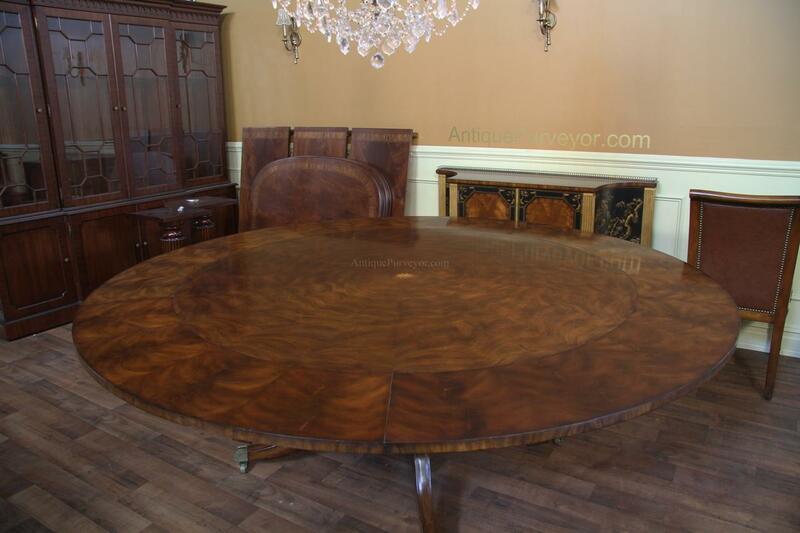 Description: 64-inch Round mahogany dining table with perimeter leaves on sturdy birdcage style pedestal. 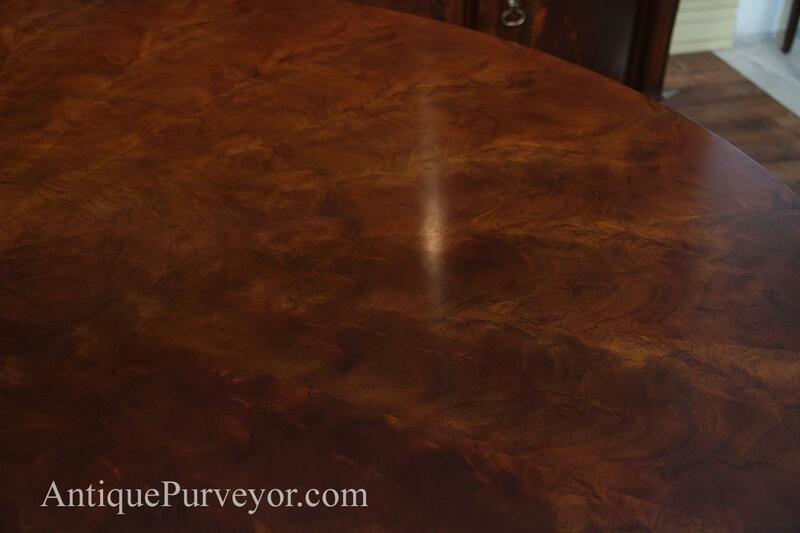 This formal table has a medium brown finish. 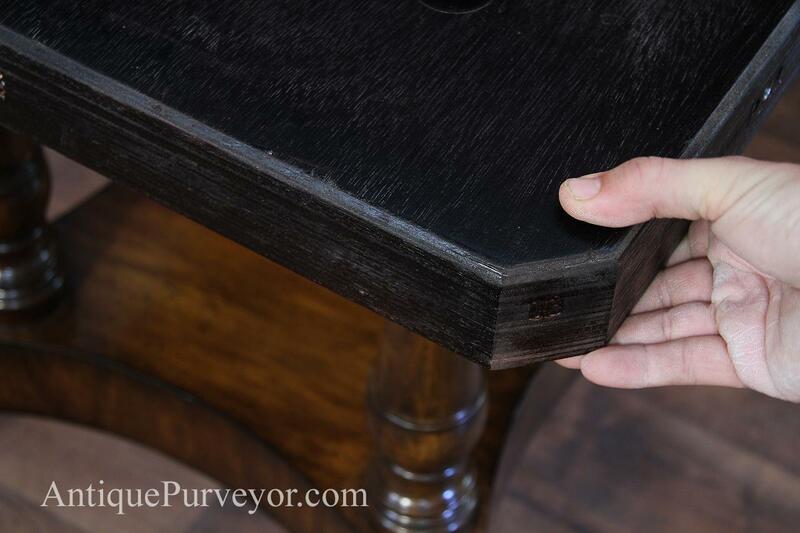 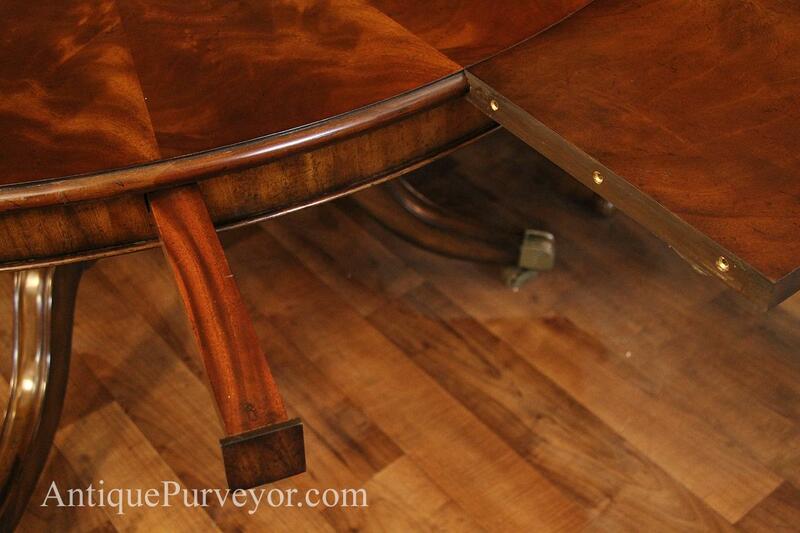 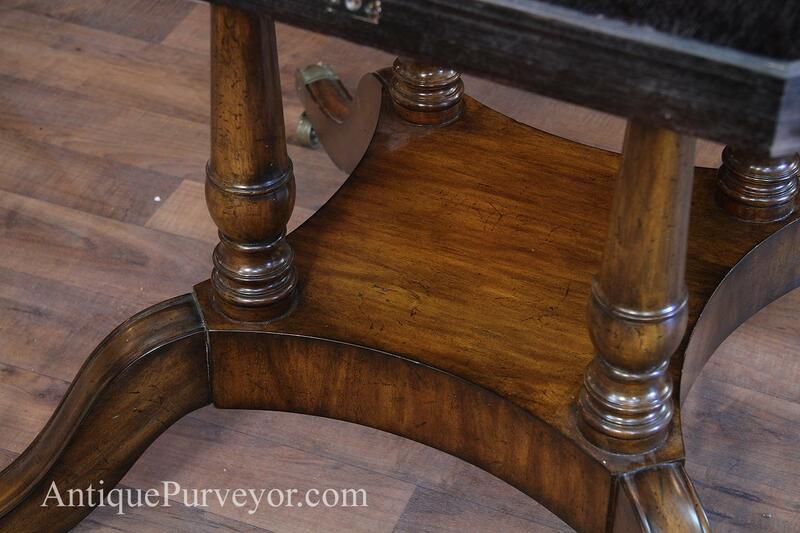 This overbuilt table has a hardwood frame built on the underside to prevent warping over time. 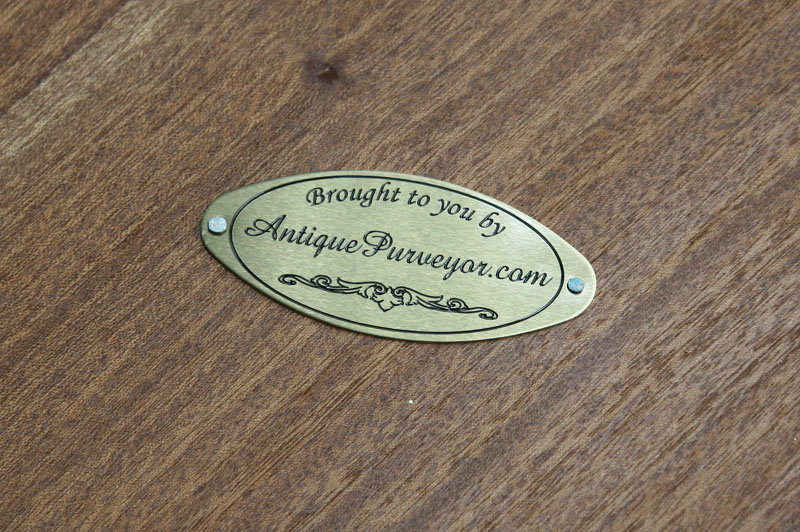 Pedestal secures onto table top with easy to handle hardware for a friendly install into your home. 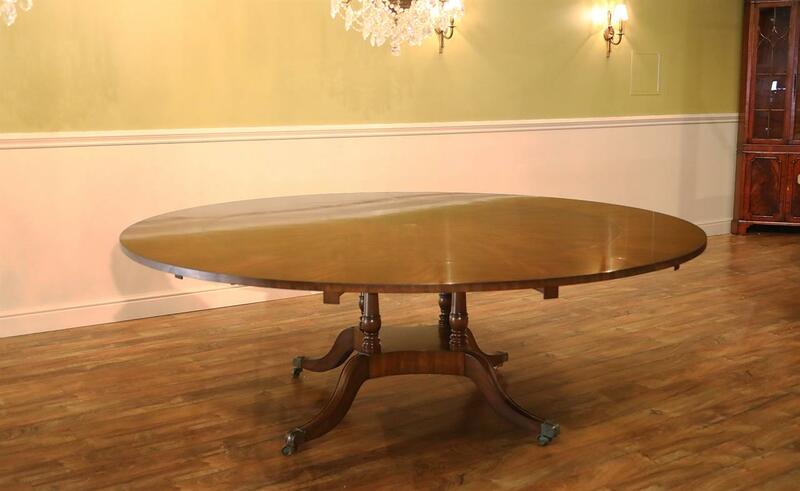 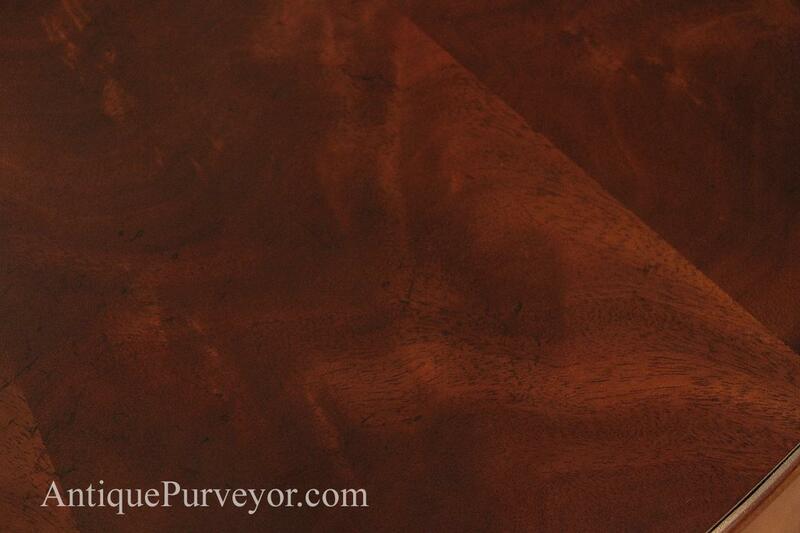 Finished with a Matte sheen, this table is a great choice for traditional casual dining spaces. 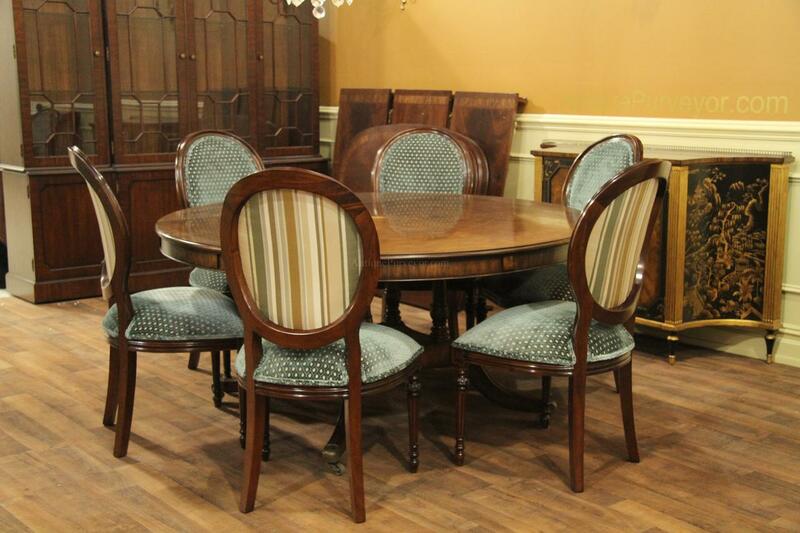 Lightly distressed, as shown in pictures, it is a great family table that you can use and enjoy without much fear of wear and tear. 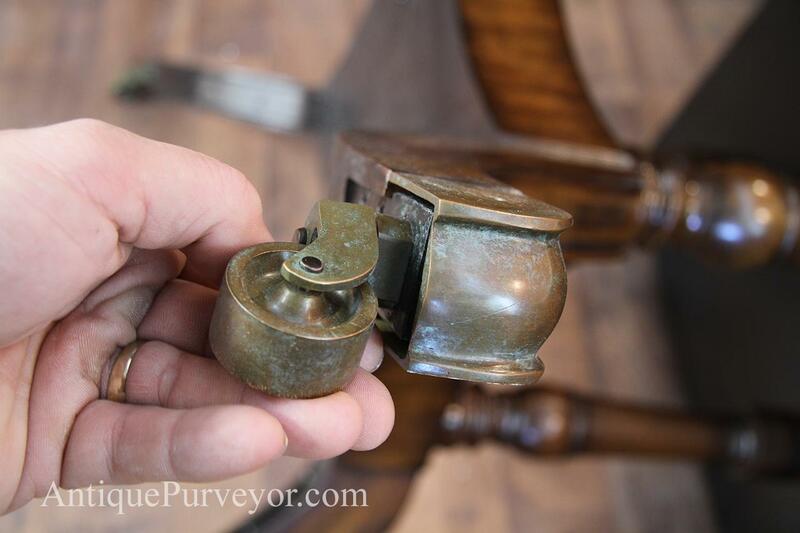 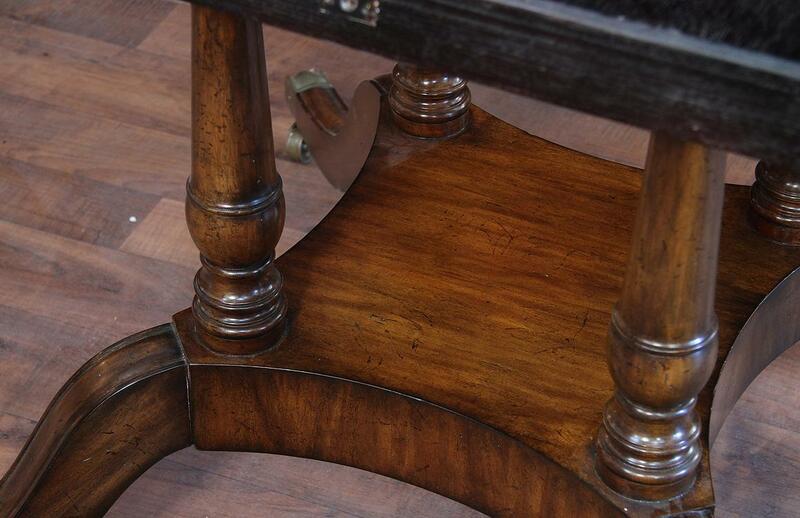 Heavy birdcage pedestals are also well constructed and the 4 outswept legs are fitted with solid brass casters. 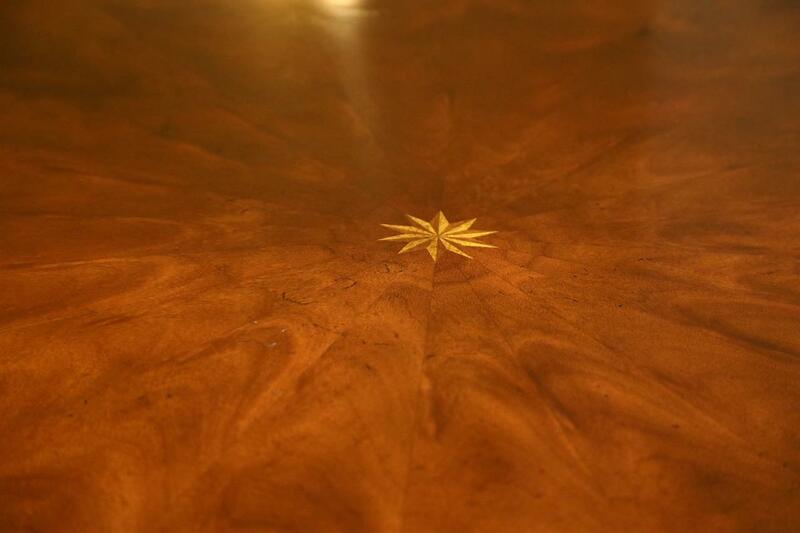 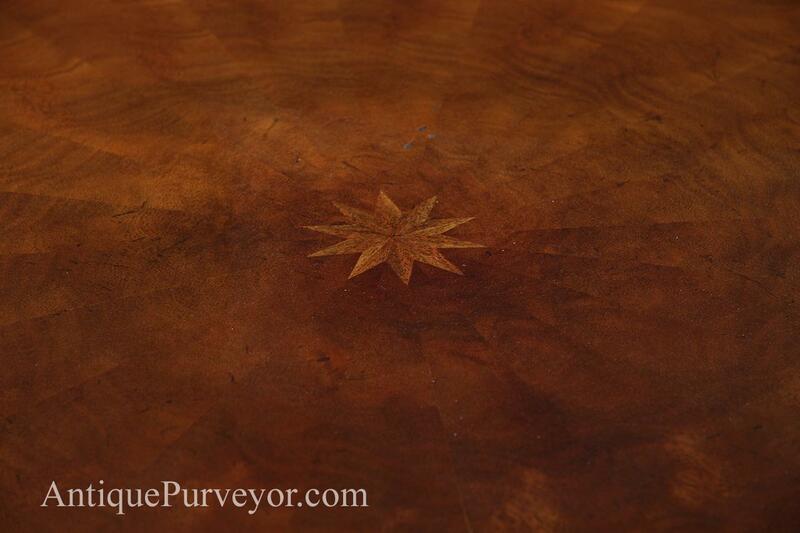 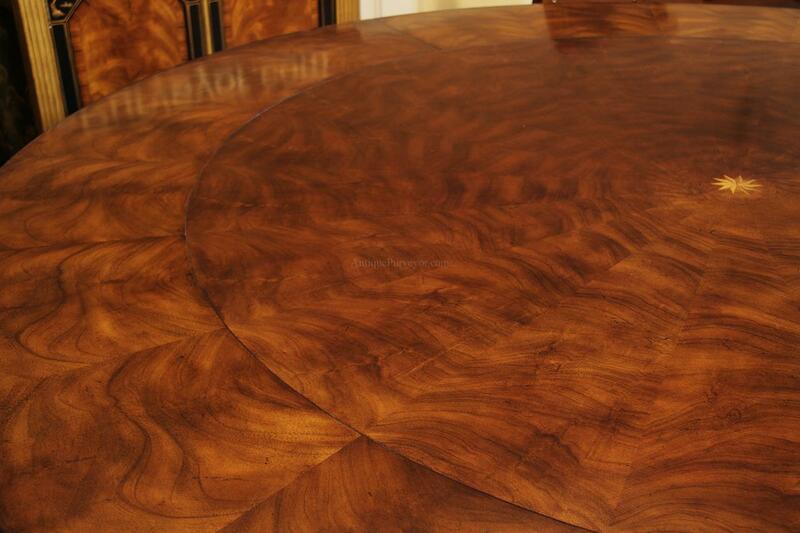 Center of table has a small windrose inlay. 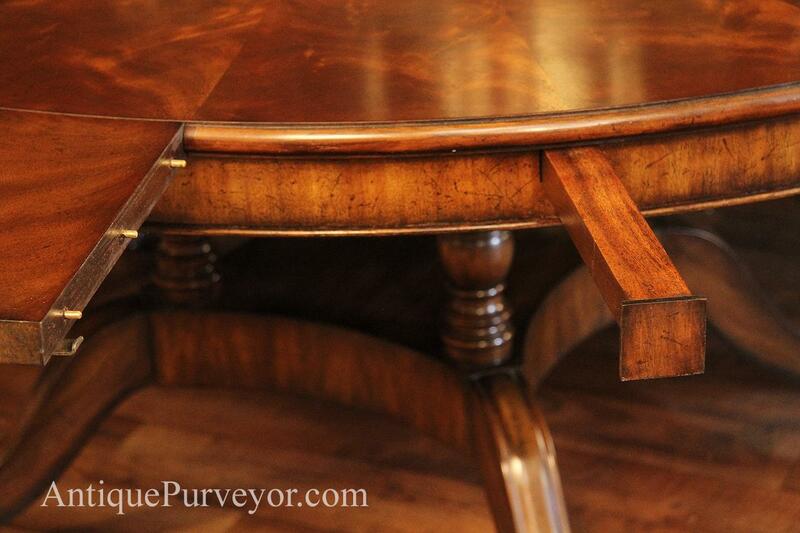 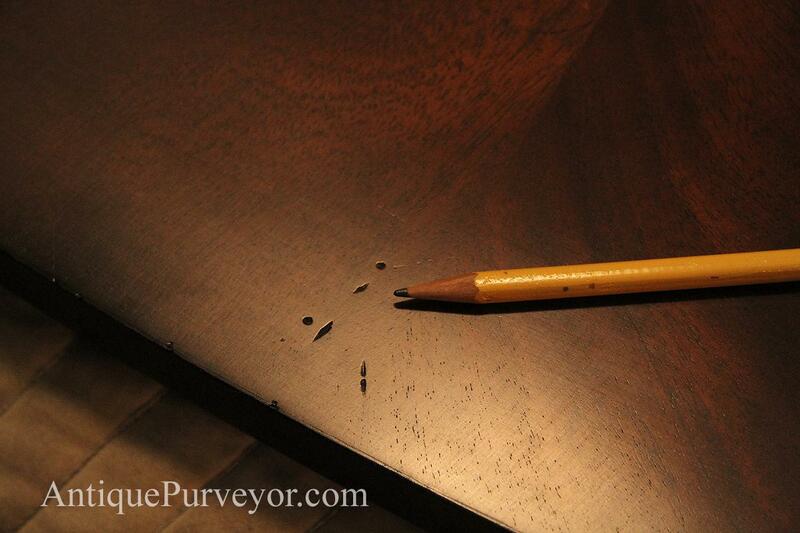 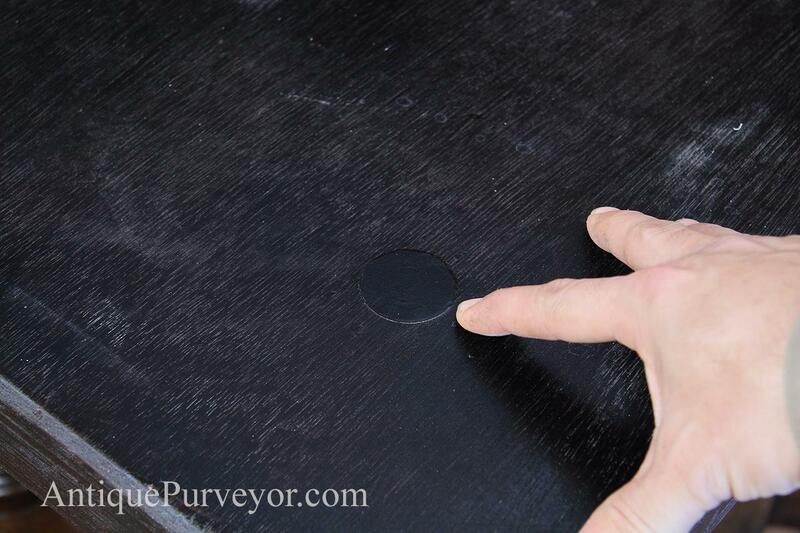 The table slides pull out and are numbered to correspond with the correct perimeter leaves. 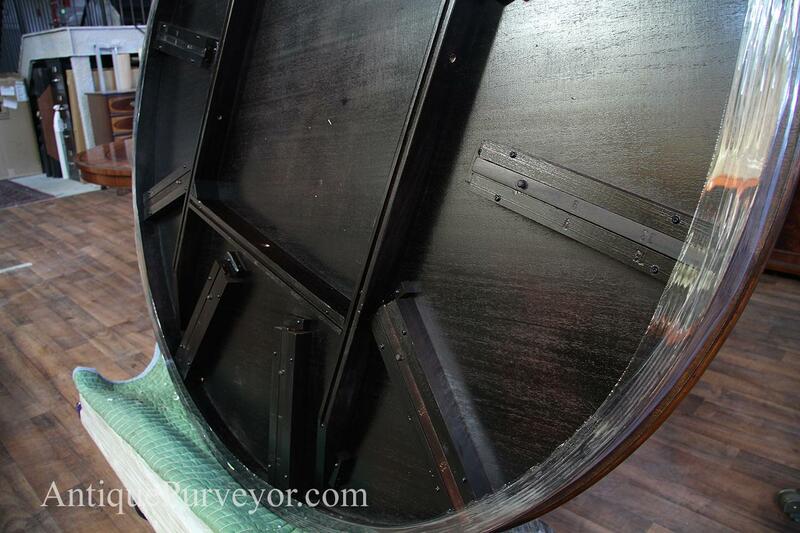 Leaf locks hold everything snug while fully assembled in the 88-inch configuration. Most perimeter tables are 84 inches, these extra few inches increase your chances of seating 12 people at this table, although it would be tight family style setting.